Nobody knows your cat better than you. That’s why we created the imagination inspiring kitty city cat furniture system – the easy-to-assemble, modular, expandable environment you design for your cat’s individual lifestyle. Covert operative frisky friend sleeping fur ball. Cats cycle through various personalities during the average day. Whatever the caper, they will love the stimulating and comfortable urban metropolis you create especially for them. No need to ponder the possibilities – get started building the ultimate city for your kitty right now! Over 1 million kitty cities have been sold. Modular cat furniture. Easy to put together. All of the pipes and connectors are universal for fast assembly. Build the cat condo of your cat’s dreams in minutes. 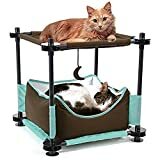 There are cat condos for sleeping, there are cat furniture kits for scratching cats, and there are kitty city kits for active and playing cats. Joint the kitty city cat furniture crowd. We would love to hear your feedback, see your pictures, and learn what your cats loved about kitty city. Your pictures, videos and feedback help kitty city design the next cat furniture models. Kitty city is easy cat furniture to take down when not in use. Kitty city uses premium sisal for long lasting scratching. Materials are durable and safe for your pet. Cat toys and jingle bells are included.